The library will be closing at 2:30 today. All potential members of the Spanish National Honor Society need to turn in their application forms and fees to Miss Ward or Mrs. Marzana no later than today! Key Club will be sponsoring the Red Cross blood drive on Tuesday, December 4th, from 8:30am – 1:45pm. Stop by the sign up table at lunch or Ms. Buchanan’s room – 107 – for the required paperwork. You must sign up in advance, and return the signed forms to donate blood. Donating blood once can help up to three people! Please consider donating. 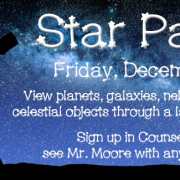 On December 7, at 9:00 PM, there will be a star party at Lafayette, weather permitting. If you are interested in seeing planets, galaxies, nebulas and other celestial objects through a large telescope, please sign up in the counseling office. See Mr. Moore if you have any questions. We have a new class in second place for DECA’s winter coat drive! Mr. Beard’s 2nd block class has stepped up, but still has competition from the first place class, Mrs. Peratsakis. Students, don’t forget to bring in your coats! Seniors, please don’t forget to bring in your holiday stocking and/or non-perishable food items. All items should be placed in the boxes located in front of the Security office. Items for the holiday stockings will assist underprivileged children ages 3 to 12. Thank you for making a difference in the lives of others this holiday season. Rams! Psychology students, Nicole Warner and Gabby Ricci, have started a Heritage Humane Society drive for the holidays. Please donate any dog or cat food, toys, blankets, etc. to Mrs. Norton’s room, room 116. Please include your name and first block. The first block class that donates the most by Christmas break will receive a Duck Donuts breakfast after the New Year. Let’s all help these animals feel loved, and give them a holiday that will brighten their lives! Mrs. Hanks’ Pre-Calculus students recently studied ellipses, using mathematical equations to determine how long it would take a spacecraft to travel on its elliptical path from Earth to Mars. 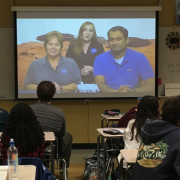 The lesson coincided with the landing of NASA’s InSight rover on Mars. As part of that event, NASA Langley hosted a webinar for K-12 students, which Mrs. Hanks’ students were able to “attend”. They also participated in a Q&A session, during which their question, about how ellipses and hyperbolas are related to space flight, was answered by NASA STEM experts. All potential members of the Spanish National Honor Society need to turn in their application forms and fees to Miss Ward or Mrs. Marzana by this Friday, November 30th, 2018. DECA’s winter coat drive is off to a great start! Mrs. Peratsakis’ class is in first place for the Krispy Kreme donuts; Mrs. Bahl-Moore and Mrs. Napier’s classes tied for second place. Don’t forget to donate your winter coats, hats and gloves through your first block class! Did you know that seat belts reduce serious crash-related injuries and deaths by 50%? Seat belt use saves almost 15,000 lives each year! Air bags provide added protection, but are not a substitute for seat belts. Do not unbuckle while the car is in motion, no matter how close your destination. Remember, “Click It or Ticket, It’s the Law”. Throughout the year we, at Lafayette, will periodically check to see if you are wearing your seat belt. Student drivers – if anyone in your vehicle is found to be unbuckled, you will lose your parking pass, and your parents will be notified. Again, “Click It or Ticket, it’s the Law”. 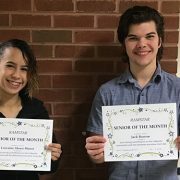 Congratulations to Lorraine Abreu-Muniz and Jack Barrow for being selected Seniors of the Month for December 2018. Lorraine and Jack were nominated by staff members as two students that are motivated, dedicated, and respectful. The commitment and focus you show every day to the Lafayette community is amazing. Key Club will meet today, after school, in room 107. The Model U.N. will meet today in room 114 at 2:30. Please remember to bring your meeting materials from last time. The library will be closing at 2:30 this afternoon. Lit Mag will meet today, after school, in room 313, NOT room 103. DECA will hold a brief meeting after school, today, in room 415. There is a Forensics meeting today, after school, in the Black Box Theatre – room 623. All team members, both old and new, are required to attend this important meeting. December 6th is our next meet, and category sign-ups will take place today. Please see Mrs. McCorry or a team captain if you have any questions. Baseball workouts will take place tonight, from 7:00 – 9:00 PM, in the auxiliary gym. Key Club will meet on Wednesday, November 28, after school in room 107. The Model U.N. will meet on Wednesday, November 28, in room 114 at 2:30. Please remember to bring your meeting materials from last time. The holidays are coming, and it’s time for some yummy treats! Celebrate by designing and printing a cookie cutter on the library’s 3D printer. All designs are due by Wednesday, Dec 12th, and voting will take place during lunches on Tuesday, Dec 18th. All participants will get to keep their cookie cutter, and the winner will get a Barnes & Noble gift card. Please visit the library for more information. DECA is collecting gently used winter coats, hats, and gloves from your first block class through Friday, December 14th. All items will be donated to FISH Inc. in Williamsburg. The first block class who donates the most will receive Krispy Kreme donuts before the winter holiday! DECA is collecting gently used winter coats, hats, and gloves from your first block class, today through Friday, December 14th. All items will be donated to FISH Inc. in Williamsburg. The first block class who donates the most will receive Krispy Kreme donuts before the winter holiday! Baseball workouts will be this evening, Tuesday, November 20th, from 7:00 – 9:00 PM in the auxiliary gym. The first indoor track and field practice will be this afternoon at 2:45 in the upper commons. Please be dressed and ready to practice!